Welcome... ...to the little church with a big heart! Our mission is to be a family of believers that Know Jesus, Love People, and Treasure Truth. 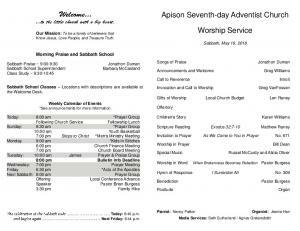 Apison Church Notices WELCOME TO OUR VISITORS! We're happy you have chosen to worship with us today. If we can assist in any way, please see our Head Elder, Eric Schoonard or today’s Resource Elder, Jim Purple. Today ~ Members, please invite guests to your home to enjoy lunch and fellowship with you and your family. Prayer Requests ~ Elmendorf family ~ mourning the loss of Archer, church member Purple Family ~ as they mourn the loss of Ellen’s sister Mashchak Family ~mourning the loss of Nadine Clarke, church member Intercession for one another’s burdens is so important. If you have a prayer request, please see the Head Elder, Resource Elder or email [email protected] Healing ~ Leonard Thomas ~ is recovering from surgery, remember him in prayer as he heals. Special Needs ~ Prison Ministry ~ addresses on the Bulletin Board for fellow members in prison. Encourage them with cards. How We Love Seminar ~ today, 3 pm (note change in time). Men ~ Join us in "The War Room". Review battle strategies from God's Word; learn how to fight the enemy and live in victory over sin. Join us and become a fellow soldier on active duty for Christ. 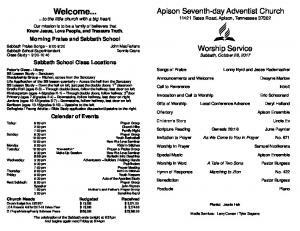 Sunday’s, 7 pm, Apison Behavioral Center, 11014 Apison Pike. Funeral Service ~ for Nadine Clarke, tomorrow, Sunday, Jan 24th at 11 am. There will be a potluck lunch following the service. Birthday Celebration ~ You are invited to come celebrate, Anita McGrath's mother, Audrey Schanke's 90th Birthday tomorrow, Jan. 24th, 1 - 3 pm (come and go) in the Fellowship Room. Prayer Conference ~ featured speaker Pavel Goia, from Romania, Feb 19-21, at Cohutta Springs. Want to grow in your prayer life, learn to commune with God and experience the transforming power of a walk with God. Early Bird Deadline: Jan 25 www.gccsda.com/events/prayerconference2016 or contact Virginia Holley. Pathfinder Fund Raiser ~ beginning next Sabbath, we will have our Aluminum Can Container near the front steps of the church. So, please start gathering your cans to help us raise funds for the Union Camporee next fall. Thank you! Biblical Prescriptions for Life Program ~ by Dr James Marcum on January 30th, 25pm at the ICCM Theatre. It focuses on why we are sick, how to make changes and the evidence for worship. Register at BiblicalPrescriptions.com or see Martha Dutterer. SS Investment Label Program ~ Atlantic Natural Foods is changing its UPC label policy. The 4th quarter 2015 report is our last chance to get the funds for our UPC's for SS Investment. The reports have to be postmarked and on their way to the conference by January 31. After that, the money will be retained by the Conference for a worthwhile project to be decided. Info, contact Penny White. Please get you labels in SOON! Grief Share ~ seminar/support group on Mondays at 10 am or Tuesdays at 6:30 pm starting Feb. 1st. To register, 423/236-4214 . We know it hurts and we want to help. Conference Children's Ministries Convention ~ Join us February 12-14 and come away with an eternal outlook for children's ministry. Be inspired by 7 to 12 year old dynamic preachers! Register today registration.gccsda.com Youth Vespers ~ Sabbath, Feb 13 @ 5:30 pm. Contact Tori Beason for details. Mother’s & Father’s Prayer Group ~ meets the 3rd Sabbath, following the Church Service. See Nancy Patton or June Paynter for more info. 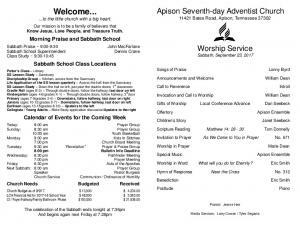 Reversing Diabetes Program ~ hosted by the Apison Health Ministries Department begins Thursday, Feb 25th – Mar, 31st, meeting each Thursday evening here at the church. Info or to pre-register, Catherine Hustad 423-667-0914 or Martha Dutterer 423503-4498. Church Board Meeting ~ this month we are moving the board meeting to 4th Monday night, January 25th to allow our new treasurer extra time to close the books for the month/year & provide more accurate reports to the Finance Comm. & Church Board. Prison Ministry ~ Would you share your faith with those who are ready and willing to listen? We are looking for committed men and women with a passion for souls who would be trained and mentored to minister to the forgotten ones who are in our local jails. If you are interested, contact John Holley at 423-316-6722. Training opportunities coming soon. Jeff Hunt In Concert ~ this coming Tuesday, Jan 26th at 7 pm. Jeff is an International Award winning Singer/Song Writer, former member of The Heritage Singers and 3ABN vocalist. Come enjoy Jeff’s music, humor, passion and insights into the Christian walk. 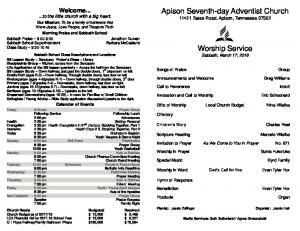 Area Announcements Sunshine Bands ~ of music, ministry and friendship are welcome at The Lantern of Collegedale on the 2nd and 4th Sabbaths of each month at 3pm. Messy Church @ Bowman Hills ~ has been canceled for January due to inclement weather forecast. Look for the February dates soon. "Hot spot” ~ A place where youth can connect with God and with each other will be held at Collegedale Community Church, tonight, Jan. 23rd at 6:30 pm. 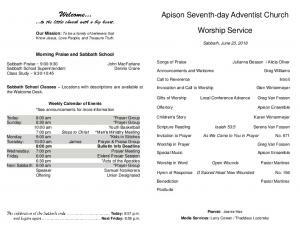 Worship, music, prayer, service, friendship, food and fun. Future dates: Feb. 27 and March 26. For more info call / text Herby Dixon 423-883-0656. SonRise Auditions ~ for main cast of SonRise, Collegedale Church’s walkthrough resurrection pageant, will be held January 25-28 in the evenings. Auditioned parts include Jesus (6), Mary Magdalene (6), John (6), Salome (6), Peter (6), Mary Mother of Jesus (2), Satan at Gethsemane (1), Gabriel at Gethsemane (1), Pilate (1), Thieves on the Cross (2), Satan at Resurrection (1), Gabriel at Resurrection (1), and a vocalist at Crucifixion. Cast application and audition info is available under the Audition tab at www.comeseejesus.com. To schedule an audition or for more info, email [email protected] Questions or No internet access?, call (678) 314-1011 for more info. SAU’s School of Nursing ~ welcomes Dr. David DeRose presenting “Strategies for Optimizing Mental Performance, Naturally.” February 16, 2016 8:30 AM – 12 Noon for Nurses (obtain 3 CEU’s) and 7 pm open to the public at the Collegedale SDA Church. Natural methods to lower blood pressure; for info or to register for CEU’s, Linda [email protected] or (423) 236-2155. The Samaritan Center ~ needs grocery bags! Our stores use 800 - 1000 plastic bags every day and are always running low. Exec Dir. Tony Dahlberg invites you to make a habit of "giving your baggage to the Lord, and your plastic bags to us!" SE TN Faith Alliance Mentor Team Training ~ to be held Feb. 7, 2 – 5 pm at the Chattanooga 1st Church. Learn about this unique ministry that helps restore lives through trust-based relationships. This mentoring program is for the incarcerated men and women that will be returning to our communities and neighborhoods. With training, you could be an advisor, a true friend and a spiritual ‘coach’ to prepare them for re-entry and to be there for them when they are released. This initiative is guided by the faith community with the TN Dept of Corr. (TDOC) serving as a supportive partner. Call Britni, 706.629.7951 ext. 395 for info.